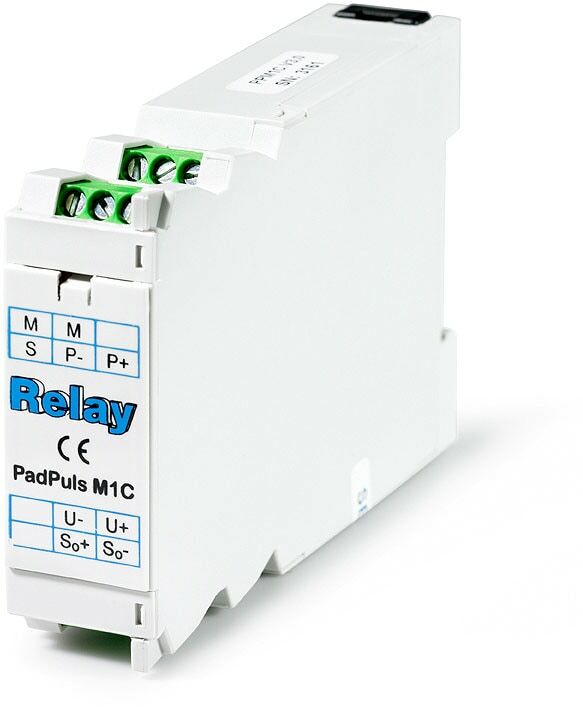 The 1-channel pulse adaptor PadPuls M1C allows the use of meters with pulse output as M -Bus slaves. So for example, data from a simple water or electricity meter can central be read out by M-Bus. Supplied by M-Bus, or integrated battery at an M-Bus failure, needs no power supply unit. Full functional even if operated with battery. The PadPuls M1 series of devices connects meters with contact output to the M-Bus system. This is a simple and flexible solution for reading already installed counters and measuring meters for electricity, gas, oil, water and heat. The power for the impulse adaptor is taken from the M-Bus. An integrated battery maintains the count function in case of a bus voltage failure. The capacity of the battery allows operation without M- Bus connection for guaranteed 7 years. During installation the PadPuls M1 can easily be adapted to the pulse output of the meter. The measured medium, the pulse value, the pulse unit and the initial meter count are nearly free adjustable to the individual meter by setup software. An integrated security feature prevents data configuration after installation without opening the sealed housing.